I should be on my way to the airport in a few hours. I've always been bad when it comes to plane travel, always problems trying to sleep right before a trip. Ok, so it didn't help that I agreed to watch one last film with my roommate. Now, it's almost 3 am...*yawn*. I'll at least get a nap done. 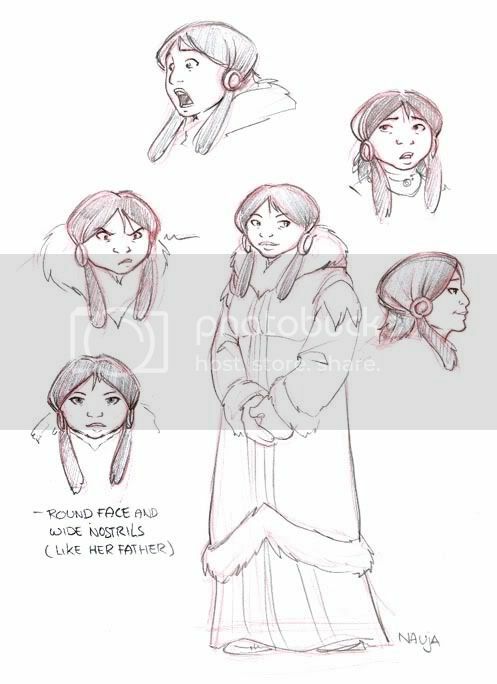 Before I leave, some Water Tribe character sketchies-studies. If I am going to start cleaning up part one a bit, I need to start establishing more how these extra characters look like. 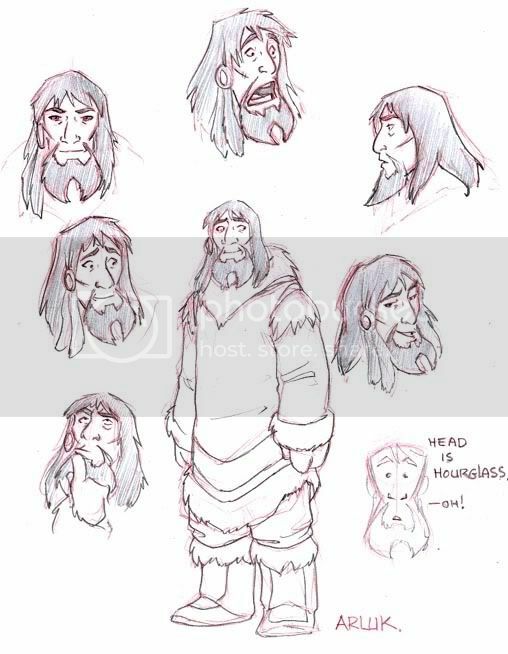 Arluk- he just started as one of the guys at the forge. His character simply emerged afterwards. He became the second hunter that found Zhao. The more I drew him, a "formula" started to establish itself on how he should look like. 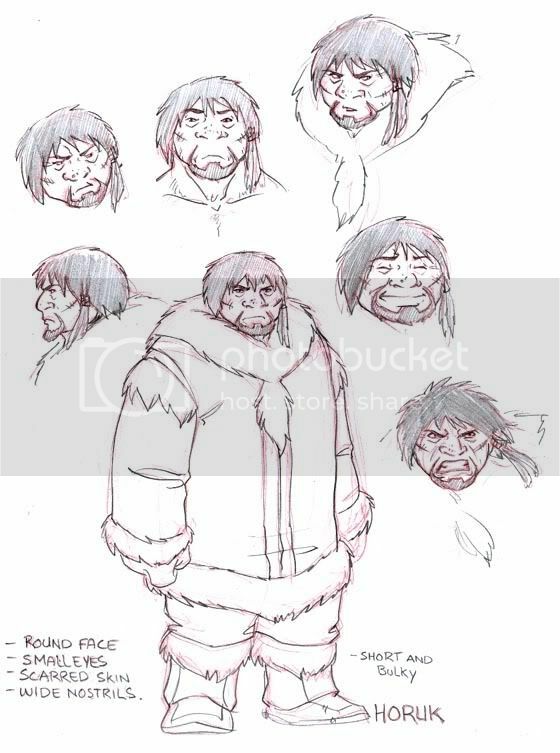 Horuk- hasn't really changed much from his first sketch, so I didn't modify him a lot. He'll possibly still evolve slightly as I keep drawing him, as a lot of characters I draw tend to do. Nauja- she changed from her first sketches in part 1, until I had to draw her again in part 3. She'll probably still evolve slightly, though the main points are down. Lao- His basic head shape was borrowed from an old character of mine. Change a thing or two and voila. His clothes may still change slightly, but I know he'll want to keep some sort of...er..."decorations" on him. Yueh- Still fiddling around with his head. He doesn't want me to change his looks too much, so we'll see. And Kwon- I really don't need to do a lot of sketches of him, he's so basic even in his expressions - think butler. What? No Zhao? Meh, everyone knows what he looks like anyway. Yeah, ok, you have a point- we don't know what he looks like without much clothes on...as if I would ever dare post that!! Hmmm...that would be a bit too cold for the Water Tribe setting. I just figured out who Kwon reminds me of. Alfred. Because, after all, as cool as Batman is, he still needs Alfred. I really like the rest of the designs too. Haha, I guess I had many thoughts of "Alfred" type character in my head. You gotta admit, it would work so well. Writing this atthe airport. Leaving soon! Alfred couldn't either, but it fooled people. ^_^ Not that he talked, or anything, just put in an appearance. I love seeing head shots! Head shots are fun to do. Trip went well, arrived safely- need rest! 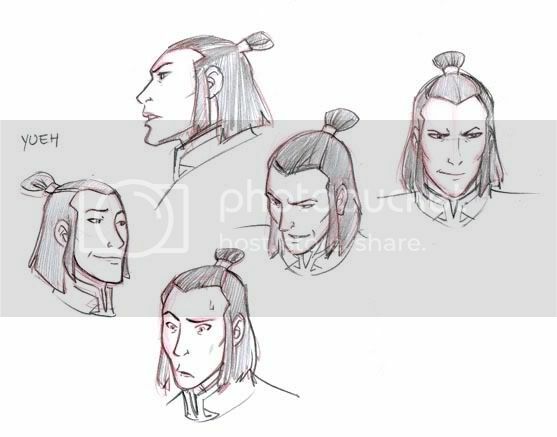 I do enjoy your character studies..(?)(profiles?) Lao and his fancy cloths..(he seems like one of those guys that are totally comfortable wearing shocking pink..)(and still be manly). Kwon=Alfred Pennyworth..in reference to Zhao and his occasional Batman-like poses (though it's mostly due to his nice and swishy cape..).. Happy resting when you can! Lao likes anything and everything fancy. If anything, he has taste. I'm really going to have to do a Zhao Batman at some point. Ooh XD These sketches are the best part! Wait no, the comic is the best part! Uh... all of it is the best part <3 <3 but seriously, I love seeing how you do your characters, theres so much little detail in their designs that you manage to keep track of that it boggles my mind. That would be the animation training- giving a formula to how the character is built and try and remember it. And I do forget details every once in a while. But that's why Photoshop with corrections exist. It's one way to try and build different facial structures for different people. Works more or less well, depending on the artist. I like working that way. Ah, your designs are so strong! So much individualism and personality. 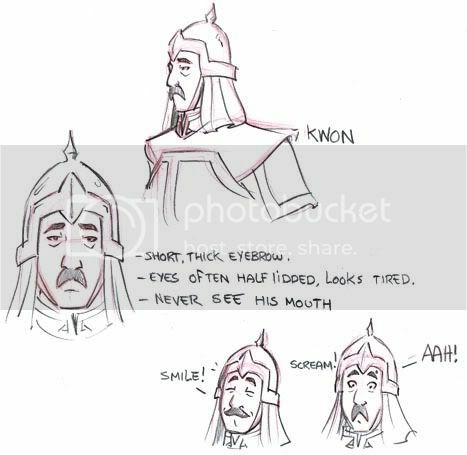 And haha, love Kwon's smile/scream sketches. Hope your travels go well! Stay safe. Hehe, that's why I love drawing Kwon- he's so simple, in a way. Trip went well, I just need to readapt to California now. Stuck in good old Burbank haze. Those are fantastic! I love 'em! Especially the Horuk and Arluk pages. Wanna go to the store now? I second gallo_de_pelea's comment. Your sketches are really inspiring and informative. Good luck with the trip and safe flight. Not sure if you ever got my email, but I'm currently looking for another roommate if you're in need of a place ;) Just let me know . I've gotten so attached to your characters - especially Nauja. She's absolutely adorable! And Kwon - who *is* Alfred. XD You really do need to draw a Batman!Zhao. All of your characters are so distinct and individual. You really get a sense for all their personalities, even just in sketches like these. Oh, and I seemed to have developed an unhealthy fondness for Lao; I've no idea why. ^^ He reminds me of someone, but I can't quite place who. You know that Lao can be one of the most charming men you will ever meet. Just don't trust him. 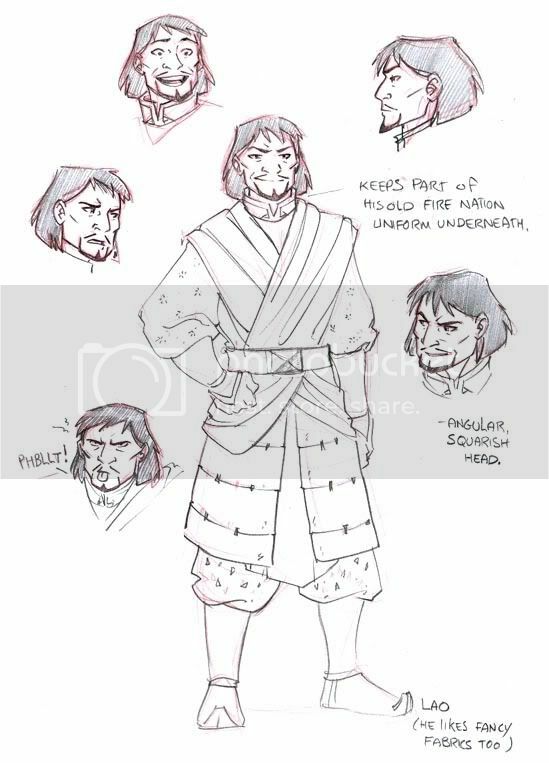 *touss touss* Fangirl de Dune aside, sont vraiment super tes designs! J'suis toujours émerveillée quand je vois des designs super uniques (dans le sens ou tous les personnages ne sont pas calqués sur le même moule). Haha, fan de Dune un jour, fan de Dune toujours! J'aurais bien aime passer plus de temps sur les designs des persos, mais bon. C'est quand meme pas un projet qui va aller bien loin au dela du web, alors je vais pas me stresser avec.